Wise Old Whooping Cranes Keep Captive-Bred Fledglings On Track A decade ago, cranes that had never before migrated followed the lead of an ultralight plane to learn the route south. Several generations later, old cranes are teaching young birds to navigate that same route. It's a clue that migration is a combination of nature and nurture, researchers say. Joe Duff/Operation Migration USA Inc. Being a wildlife biologist in the 21st century increasingly means rescuing rare animals from extinction. Among the success stories is the whooping crane. Seventy years ago there were only about 16 birds left on the planet. Now there are about 600. But breeding more birds isn't enough. Scientists want to restore the crane's way of life, too. And a team of ecologists at the University of Maryland have discovered something that suggests they are succeeding: Captive-bred whoopers are picking up tips from older birds about how to skillfully navigate south for the winter. It's a sign that those whooping cranes are passing knowledge from one generation to the next and, in a sense, rebuilding their culture, scientists said Thursday in the journal Science. 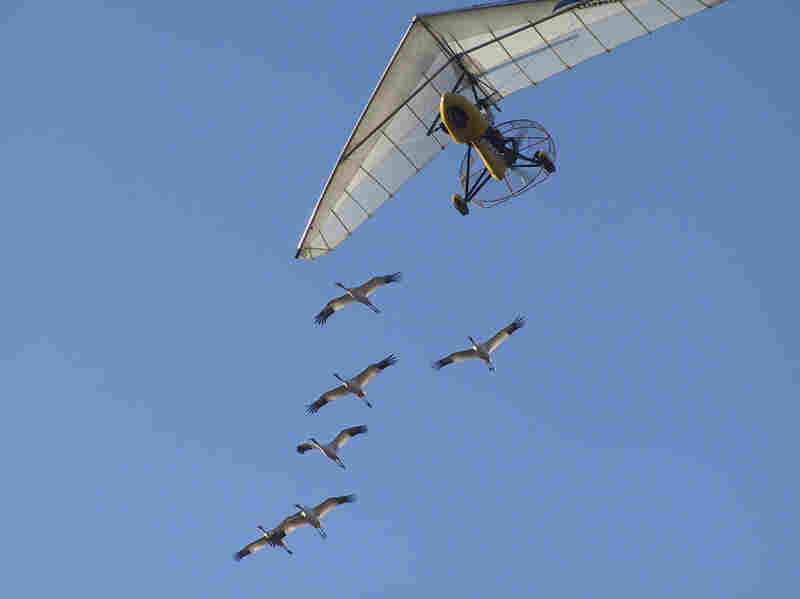 Heather Ray/Operation Migration USA Inc.
All the whooping cranes studied by the University of Maryland team received the same initial flight training as chicks, following an Operation Migration ultralight from Wisconsin to Florida in the fall. The Science study looked at data on their subsequent migrations — without the plane — beginning with the following spring. How birds navigate over vast distances during migration has long been something of a mystery. Scientists aren't sure how much is innate and how much is learned, or how much is based on landmarks, stars or even the Earth's magnetic field. 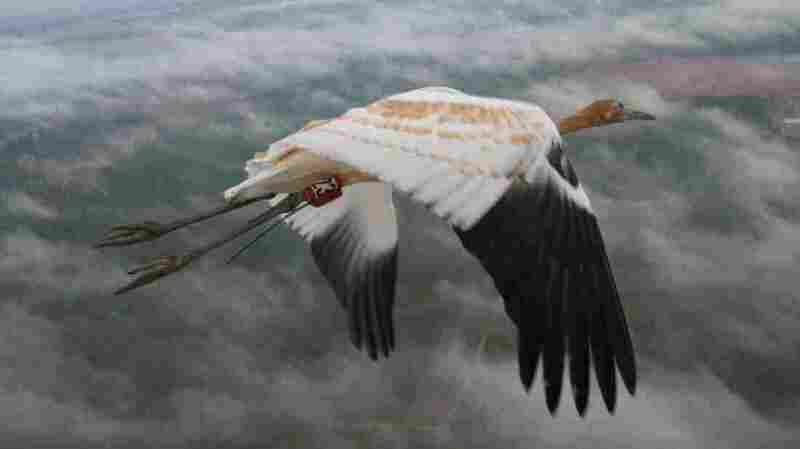 But the country's small population of whooping cranes has provided a clue. Many of the whoopers in the world were born in a wooded wilderness 20 miles from the U.S. Capitol, at the Patuxent Wildlife Research Center in Maryland. Patuxent is a hidden gem, a pocket of wilderness surrounded by highways, suburbs and government compounds. As I approached one adult whooper in a fenced enclosure on a recent visit, the bird let loose with a raucous, prehistoric screech — a call that's both distinctive of its species and a bit spine-tingling. "This is the closest I've ever been to a whooping crane," says Greg Smith, who runs Patuxent. The birds are usually a little more skittish, he says. The big whooper stands 4 feet tall, has snow-white feathers and seems a bit ungainly — yet elegant in its long-legged, mincing walk. A couple of brown-feathered 1-year-old birds peer up from the adjacent pen and peep at us. Smith is with the U.S. Geological Survey, which runs Patuxent. He says the research center is sort of the Noah's Ark for endangered animals. The whoopers we see are full-time residents at Patuxent, so we're allowed to approach them. But nearby, through the woods, is a labyrinth of fenced enclosures holding scores of young whoopers that will be released to the wild. Fabric screens secured to the fence keep them from seeing us. That's so the birds won't become accustomed to us, Smith says. "The more fear they have of humans, the better off we think their survival chances are," he says. But the cranes can sense us. Had there been a roof over their enclosure, they would have raised it with their calls. Whooper eggs from around the country are brought here so biologists can hatch the eggs and raise the birds. People who work with new birds wear white coveralls and hoods to look less human-like and more whooper-like. They even use whooper puppets to mimic adult birds. "They show the young birds how to peck at food," Smith says. But here's the weirdest part: Workers drive around the enclosures in an ultralight, one-person aircraft ... that moves along the ground. It's the first step in teaching these birds to identify an ultralight aircraft as a mature whooper. Then when the birds are yearlings and it's migration time, they're shipped up north, to Wisconsin. 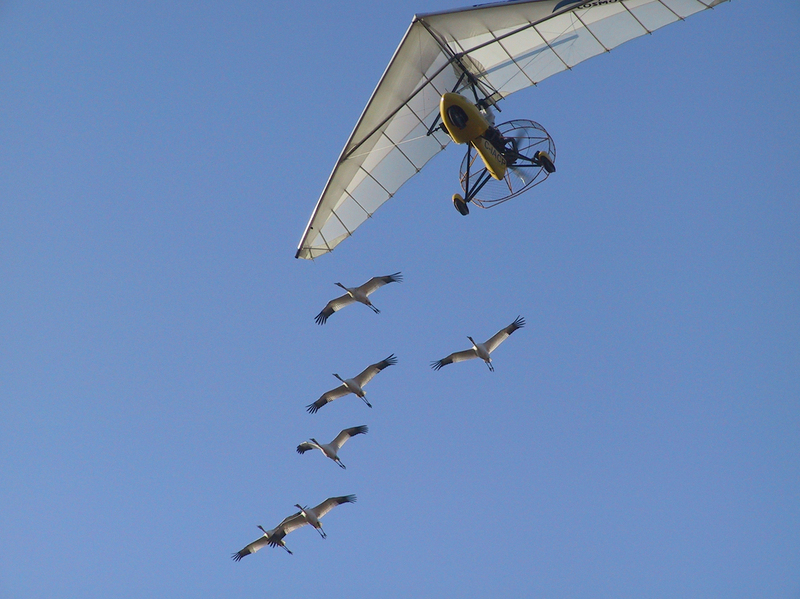 "The ultralight in Wisconsin not only circles on the ground and teaches them to follow," Smith says, "but it also ultimately lifts up into the air" and accompanies the whooping cranes on their great migration, which lasts between 50 and 100 days. Every year a batch of youngsters follows an ultralight aircraft, flown by a group called Operation Migration, down to Florida. After that first migration, the birds are able to find their way south each year without following a plane. One trip is enough to learn the way — sort of. Scientists have been watching cranes migrate on their own for a dozen years. Eventually, they noticed something peculiar. Some groups of whoopers flew along a nice, tight route. But others tended to drift off the ideal migration route, sometimes 40 or 50 miles away. That's not good. The birds use more energy when they stray from their route, and they don't end up in the safest places for roosting and finding food. When scientists compared the straight-arrow cranes to the wanderers, it appeared there was only one difference between them: an experienced bird. "If there was one older bird in the group, they would fly more accurately," says ecologist Thomas Mueller at the University of Maryland. He and his colleague William Fagan came to that conclusion after ruling out other hypotheses. For example, they knew the pedigree of each bird, so they could check whether more closely related groups did better. That would suggest some genetic, instinctual ability was at work. But being related didn't matter. And larger groups didn't do better than smaller groups. The only thing that seemed to improve performance, Fagan says, was having at least one experienced bird along. And the older the bird got, the better the group flew. "It's amazing," Fagan says, "in the sense that it's a concrete demonstration of an animal's ability to learn and how that learning can be refined over time." Now, of course you can teach many animals — your dog, your horse — all sorts of things. Even a mouse can learn to run a maze in a lab. Adult birds teach their young to fly. Chimps teach their offspring how to dig for termites. But in the whooping crane's case, younger birds learned first from humans, then from older birds. And the birds got better at it every year. "There is cultural learning that is an improvement in a very large scale process ... migration in over 1,000 kilometers distance," Fagan adds. Exactly what the cranes are learning isn't clear. Patuxent ecologist Sarah Converse suspects they're spotting landmarks along the migration. But what's most important, she says, is that the whooping cranes are learning anything at all from their elders. We're talking about a species that's now totally bred and raised by humans, she says. These fledglings don't know squat about whooping crane life in the wild. "We're actually trying to restore not just a biological population but a culture," she says. "So there's a knowledge that whooping crane populations have that they pass on amongst individuals — not just genetically, but [through social] learning." If the whooping cranes are learning a complex skill from each other, Converse says, maybe they can learn to reproduce better in the wild — something the birds are pretty terrible at right now. But they need to figure this out if they're going to make a true comeback.